"Evangelion 2" redirects here. For the 2003 video game, see Shinseiki Evangelion 2: Evangelions. Evangelion: 2.0 You Can (Not) Advance. (ヱヴァンゲリヲン新劇場版: 破, Evangerion Shin Gekijōban: Ha, lit. "Evangelion: The New Movie: Break") is a 2009 Japanese animated film directed by Kazuya Tsurumaki and Masayuki, and written by Hideaki Anno. It is the second of four films released in the Rebuild of Evangelion tetralogy based on the original anime series Neon Genesis Evangelion. It was produced and co-distributed by Hideaki Anno's Studio Khara in partnership with Gainax. The film continues the story of Evangelion: 1.0 You Are (Not) Alone, with Shinji Ikari continuing his role as a pilot of one of the gigantic "Evangelion" mecha as part of NERV's ongoing fight against the mysterious creatures known as Angels. While replicating many scenes and plot elements from the original series, the film also introduces new ones, including newly designed creatures and new characters, such as Mari Illustrious Makinami, and integrates newly available 3D CG technology. Its ending paves the way for the significant storyline departures from the original series in Evangelion: 3.0 You Can (Not) Redo. The resuscitated skeleton of the Third Angel escapes its confinement and tries to break out of NERV's arctic Bethany Base, but Mari Illustrious Makinami, a new pilot, launches in Evangelion Provisional Unit-05 and destroys the Angel by self-destructing the EVA and safely ejecting at the last moment. Meanwhile, Shinji Ikari and his father Gendo visit Yui's grave. Shortly after, the Seventh Angel attacks, but is quickly dispatched by the newly arrived Unit-02 and its headstrong pilot, Asuka Langley Shikinami. Ryoji Kaji delivers to Gendo a suitcase containing the mysterious "Key of Nebuchadnezzar" and notes that the destruction of Unit-05 went as planned. Gendo and Kozo Fuyutsuki then visit NERV's lunar compound, Tabgha Base, to view the construction of Evangelion Mark.06, which is noted as being different from the other EVAs. They are denied permission to land, but briefly see Kaworu Nagisa sitting in space without a space suit. During Gendo's absence, the Eighth Angel attacks Tokyo-3. Shinji, Asuka, and Rei kill it in an improvised plan devised by Misato Katsuragi. Both Unit-00 and Unit-01 are damaged. Gendo returns and asks to have them both repaired, but SEELE only allows the repair of Unit-01. In an attempt to heal the relationship between Gendo and Shinji, Rei prepares a dinner party. At the same time, Mari arrives in Tokyo-3. Later, Unit-04 and NERV's U.S. branch are destroyed during an experiment, prompting the U.S. government to send Unit-03 to Tokyo-3. Due to an international agreement that allows no more than three functioning Evangelions per country at a time, NERV seals away Unit-02 and schedules a test of Unit-03 on the same day as Rei's dinner party; Asuka volunteers to take Rei's place as the test pilot. Once Asuka activates Unit-03, the Ninth Angel possesses the EVA and goes on a rampage. Shinji pilots Unit-01, but refuses to fight the Angel for fear of harming Asuka, who is still trapped inside. Gendo orders the activation of the Dummy System, which makes Unit-01 autonomous, and allows it to savagely destroy Unit-03, crushing the cockpit in its teeth. Emotionally wounded by his father's cold decision, Shinji leaves NERV. Asuka survives, but she is grievously injured and placed in quarantine for fear of mental contamination by the Angel. Shinji heads out of the city, but the Tenth Angel attacks, so he flees to an emergency shelter. Gendo fails to activate Unit-01 with the Dummy System, so Mari hijacks Unit-02 and goes to fight the Angel alone. She removes Unit-02's restraints and launches an all-out attack, but the Angel severely damages Unit-02. Rei joins the fight with the damaged Unit-00 and charges at the Angel with a missile. The missile detonates, but fails to destroy the Angel. The Angel consumes Unit-00 and integrates it with its own body, allowing it to bypass NERV's defenses. Upon seeing Rei consumed along with Unit-00, Shinji rushes to Gendo and asks to pilot Unit-01 again. Shinji fends off the Angel, but before he can defeat it, Unit-01 runs out of power and shuts down. Unit-01 reactivates in berserk mode in response to Shinji's rage at the loss of Rei. It easily takes down the Angel, and Shinji uses the EVA to reach inside the Angel's core to save Rei. Unit-01 then starts transcending its physical boundaries to grant Shinji's wish. At the moment Shinji retrieves Rei, Unit-01 pulls Unit-00's core out of the Angel. The Angel explodes and its remains, along with Unit-00's core, are absorbed into Unit-01, fusing them all into one being. Unit-01 then sprouts giant wings of light, and Misato, who has been watching the battle, sees that they are identical to the ones she saw during Second Impact. Ritsuko realizes that the EVA has become a divine being, triggering Third Impact and declares this to be the end of the world. In a post-credits scene, a spear shoots down from the Moon and impales Unit-01 in the middle of its apotheosis, neutralizing it and stopping Third Impact. Kaworu then descends from the Moon in Mark.06, saying that this time, he will show Shinji true happiness. 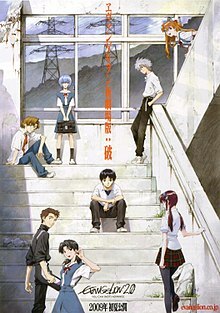 In September 2006, it was confirmed the second film produced as part of the Rebuild of Evangelion series, with a release date tentatively set for January 2008 release and a 90-minute running time. In November 2006, the December edition of the Japanese anime magazine Newtype confirmed the second film was written during post-production on the first film. Anno stated the introduction of new characters and Evangelion units would begin from the second film onwards. The release date was pushed back several times from the original announcement of January 2008: first, to a December 2008 release before an update on the official website on October 6, 2008 announced the official English title and an "early summer 2009" release date. A final postponement revealed that the film would be released on June 27, 2009. In May 2009, Hikaru Utada returned to the series and provide the theme song for the film, "Beautiful World (Planitb Acoustica Mix)". Utada previously released "Beautiful World" for Evangelion: 1.0 You Are (Not) Alone in 2007. A soundtrack album featuring the film's score by Shirō Sagisu was released on July 8, 2009 in both the regular and special editions. The special edition contains a bonus disc featuring score selections not edited to fit into the film. The film is also inserted popular Japanese folk songs, "Tsubasa o Kudasai" and "Kyō no Hi wa Sayōnara", performed by Megumi Hayashibara. The film's initial teaser trailer, shown after the end credits of Evangelion: 1.0 You Are (Not) Alone in the style of the "next episode" previews in the original TV series, hinted at the adoption of Unit-02 and its pilot Asuka Langley Shikinami and showed scenes inspired by the original series (the disappearance of Unit-04 upon the startup of its S² engine, the possession of Unit-03 by Bardiel, Evangelion Units 01 and 02 fighting Zeruel) as well as new material (the newly designed Units 05 and 06 and the unintroduced new character of Mari Makinami). A full trailer was released on April 2, 2009. The character Makinami Mari Illustrious, teased in the teaser trailer and appearing in the Nintendo DS game Petit Eva: Evangelion@Game (ぷちえゔぁ～EVANGELION@GAME～, Puchi Eva ~Evangelion@Game~) as a character picture prize with the name of Mari (マリ) and the simple description of "Mysterious girl", was introduced in the April 18 EVA-EXTRA01 paper magazine by her full name, following the Evangelion naval naming convention, with Maaya Sakamoto as her voice actress. Similarly, theatrical posters revealed that the character Asuka's family name would be changed from Sohryu to Shikinami. Evangelion 2.0 made its International/US premiere at the Hawaii International Film Festival on October 24, 2009. The film made its Canadian premiere at Waterloo Festival for Animated Cinema on November 21, 2009. On December 3, 2009, the film was released in Hong Kong and South Korea. In Australia, the film made its premiere at the Reel Anime Festival in September 2010. The film premiered in Ireland on March 20, 2010 as a part of the Irish Film Institute Anime Weekend. The film screened on July 10, 2010 as a part of the Fantasia Film Festival in Montreal. The film made its European premiere at Lucca Comics 2009 on November 1, 2009 and was screened at the Asia Filmfest in Munich on November 6, 2009. Despite former announcements, Evangelion: 2.0 You Can (Not) Advance was not screened at the Animotion festival in Bonn because of licensing problems. The film also competed in the Sitges Film Festival in Catalonia, Spain on October 4, 2009 in the Anima't category. In North America, Cinema Asia Releasing, Eleven Arts and FUNimation Entertainment announced that Evangelion: 2.0 You Can (Not) Advance would premiere in the United States in January 2011. It was originally planned to premiere in 70–100 theaters. However, Funimation released a statement in December 2010 confirming that it would be released in 22 theatres. Singapore: November 12, 2009 at The Cathay/The Picturehouse. South Korea: December 3, 2009. Hong Kong: December 3, 2009. Malaysia: March 4, 2010 at The Cathay Cineplex e@Curve and TGV at Sunway (after fans' petition in the forum and Facebook). Belgium: Anima: Brussels Animation Film Festival 2010. February 13 and 20, 2010. United Kingdom: Glasgow Film Festival on February 15, 2010 at 5:45pm. Indonesia: screening nationwide, beginning from July 16, 2010, only at Blitz Megaplex theaters. Distribution rights held by Pratama Film. Evangelion 2.0 was broadcast on Japanese TV (NTV) on August 26, 2011 under the name Evangelion 2.02. Simultaneously, the TV edition was played in 5 Japanese theaters; the TV broadcast of 2.0 received higher ratings than did 1.0. At the end of the broadcast, a trailer for Evangelion 3.0 was included, with an official release date of Fall 2012. In its opening weekend in Japan, the film reached number-one at the box office with a revenue of ¥510 million. The film subsequently grossed ¥4 billion ($43 million) at the Japanese box office, making it the second highest-grossing anime film of 2009. The film's North American box office take was over $130,000, an improvement over 1.0. The film grossed $858,409 overseas, bringing the film's worldwide gross to $43,858,409. The DVD and Blu-ray release in Japan took place on May 26, 2010; unlike the 2 DVD versions of 1.0, it was released as 2.22 with "readjustments". Universum Film's German release was on September 17, 2010. The Japanese release set an Amazon.co.jp record for pre-orders, with more than 88,000, and ultimately over 800,000 pre-orders in general; upon release, it set first-day sales records (124,000 DVDs and 195,000 Blu-ray discs), topping Blu-ray sales for 4 weeks. At Otakon 2010, North American anime distributor Funimation Entertainment announced that they had licensed Evangelion 2.0 and would plan a theatrical release followed by a DVD and Blu-ray release on April 5, 2011. The release date was later brought forward to March 29, 2011 for the United States, but the original release date was retained for Canada. In May 2010, British anime distributor Manga Entertainment had announced plans to release Evangelion 2.0 in the U.K. and were waiting on Funimation to announce production dates; in December 2010, the release dates for the Blu-ray and DVD of 2.22 were announced to be June 2011. Later, the date was changed for an early release on May 30, but then finally pushed back to the original month, on June 20. Australian distributor Madman Entertainment released Evangelion 2.22 on Blu-ray and DVD on June 15, 2011 under exclusive license from NTV & Manga Entertainment. This time, Madman's DVD included all special features on the one disc, unlike its DVD release of 1.11, which came with one disc (whereas the North American DVD releases of both movies have two discs) and missing some special features (the Blu-ray came with all intact). Character designer Yoshiyuki Sadamoto designed three Be@rbrick figures of Asuka, Rei, and Mari, which went on sale on March 14, 2009 and were also available as a bundle with advance film ticket purchases. NTT DoCoMo and Sharp released a production model of the "SH-06A NERV" phone featured in the film, which Hideaki Anno and Studio Khara supervised in designing. The phone, only available in Japan between June and July 2009, was originally set for 20,000 pre-order units and 10,000 for retail sales. After selling out all pre-orders in only five hours, NTT docomo announced they would be manufacturing an additional 7,500 units to meet all orders. In August 2009, ABC-Mart, King Records, and Achilles released sneakers based on the design of Evangelion Unit-01 as part of "The Footstep Instrumentality Project." Ueshima Coffee Co., as with Evangelion: 1.0 You Are (Not) Alone, released coffee cans decorated with Evangelion characters and their Evangelion units. Medicon released "Real Action Heroes" action figures of Shinji, Rei, Asuka, and Kaworu in restyled plugsuits in August, September, and November 2009 and May 2010, while Bandai released its own line of action figures with Mari Illustrious Makinami and two separate sets of Gashapon figures in May and July 2009. Bandai also released several action figures from their Robot Damashii line of Unit-00 (Tamashii exclusive), Unit-01 (regular and night combat version) Unit-02 (regular and beast mode), and Unit-03. Lawson released Asuka, Rei, and Pen² PuchiEva figures to be sold with advance ticket purchases. Revoltech introduced several other action figures, including Unit-01 (normal and berserker modes), Unit-02, and Unit-05 (normal and repainted) as well as special exclusives available from magazine inserts (Unit-03) and 7-Elevens (Unit-00). The 320-page art book for 2.0, Groundwork of Evangelion 2.0, was released May 28, 2011 for ¥3,675. Justin Sevakis of Anime News Network praised the new character interactions and development, stating "Evangelion 2.0 feels as though the project has been put on mood stabilizers: it's not any happier, but it's more stable and certainly more focused. And in the end, it's a vast improvement." Reviewing the US Blu-ray release for ANN, Theron Martin wrote that 2.0's Asuka is "distinct from the get-go, too, as she is less bratty and more aggressively antisocial than the first one. She may have initially seemed to be the most socially adjusted Eva pilot in the TV series, but here she makes no pretenses about liking anyone – not even Kaji, whom she hopelessly mooned over in the TV series but doesn't give a second thought here – and seems motivated as much by establishing herself in a future career path in NERV as she is by her personal pride. " and praised Anno's technique where "the peak moments of the most gruesome [scene] are set to a gentle, vocalized children's song which, paradoxically, makes the scenes all the more horrific". Mania.com reviewer Chris Beveridge wrote that "watching the second installment of Evangelion is more rewarding and more difficult than the first. It's more rewarding because you're seeing this interpretation taking on its own life fully, from the way Asuka is introduced, the new character of Mari and the larger scope of how the world works with Evangelion units...They go big here with a lot of changes, changes that could annoy and irk the faithful, but it's an interpretation that is doing something different at this point and it does it well, giving it all the kind of smoothness it needs, even if it does feel rushed sometimes when there are so many Angel fights throughout it." Many reviews praised the action scenes (the Boston Globe criticizing their aesthetic as "exhausting"); The Toronto Star writes: "Sparing no time to get newbies up to speed, Evangelion 2.0 will undoubtedly confound some viewers with its jam-packed narrative and jargon-heavy dialogue but the intricately designed, hyper-kinetic visuals more than compensate, especially when seen at the scale they deserve." The Chicago Sun-Times likewise praised the action, but criticized the soundtrack for being "a weird array of elevator-style music"
The Kansas City Star's reviewer wrote "The peripheral characters are hard to keep track of, and a medieval theologian would be weirded out by all the mystical gibberish", but also praised the "terrific battle scenes and gorgeous animation. Those elements don’t compensate for every shortcoming, but they make a challenging genre much easier for novices to enjoy." (NAW: "Having introduced Mari so vividly, though, the film forgets about her for about 40 minutes....She doesn’t reappear until halfway through the film. And her purpose remains elusive.") Fort Worth Weekly's reviewer, on the other hand, praised the mystical gibberish and otaku references: "this movie trafficks in Judeo-Christian symbolism and references that often lean toward the obscure. This, along with its meta-commentary on anime itself and the ways its fans relate to it, helps set the movie apart from its fellows." The film currently holds a 75% "fresh" rating on Rotten Tomatoes. The film won first place in the Animation category of the French Lyon Asian Film Festival, narrowly beating Symphony in August in an audience vote. It won the award for Excellent Animation of the Year by being nominated for the Japan Academy Prize for Animation of the Year in 2010. Stills and draft materials from 2.0 by Hideaki Anno were exhibited at de:Künstlerhaus Bethanien in Germany as part of the Proto Anime Cut exhibition in January–March 2011, with a European tour planned in summer 2012. The next film in the series, Evangelion: 3.0 You Can (Not) Redo, was previewed in a post-credits trailer, continuing the story with Shinji and Rei still frozen within Unit-01, Tokyo-3 and the Geofront being abandoned, "NERV personnel [being] held in confinement," "Eva Mark-06 descend[ing] on Dogma," "the quickening Eva Unit-08 and its pilot," and the assembling of "the children chosen by fate." The film was released in Japan on November 17, 2012. It was released on Blu-ray and DVD in Japan on April 24, 2013 with the title Evangelion: 3.33 You Can (Not) Redo. ^ a b c "2009's Top Anime Movies at Japanese Box Office". Anime News Network. January 4, 2010. ^ a b "Evangelion 2.0: You Can (Not) Advance - International Box Office Results". Box Office Mojo. Retrieved April 25, 2015. ^ a b "Anime News Service Archive September 2006". Animenewsservice.com. September 26, 2006. Retrieved January 26, 2009. ^ "Anime News Service Archive December 2006". Animenewsservice.com. December 4, 2006. Retrieved January 26, 2009. ^ "Evangelion 2.0's Month of Release Confirmed?". furuanimepanikku.com. May 15, 2008. Archived from the original on December 5, 2008. Retrieved January 30, 2009. ^ "Evangelion 2.0 Film Set for Early Summer of 2009". Anime News Network. October 5, 2008. Retrieved January 30, 2009. ^ "Anno's Evangelion 2.0 Film Slated for June 27 in Japan (Updated)". Anime News. Network. February 20, 2009. ^ "『ヱヴァンゲリヲン新劇場版：破』作品情報　-テーマソング-". evangelion.co.jp. Archived from the original on January 3, 2008. Retrieved 2015-01-02. ^ a b "Hikaru Utada to Sing Theme of Evangelion: 2.0 Film". Anime News Network. May 15, 2009. ^ "『ヱヴァンゲリヲン新劇場版：破』オリジナルサウンドトラック". evangelion.co.jp. Archived from the original on July 2, 2008. Retrieved 2015-01-02. ^ "2 Evangelion: 2.0 Film Teasers Streamed by Yahoo! Site (Update 2)". Anime News Network. April 2, 2009. Retrieved November 20, 2010. ^ "ヱヴァンゲリヲン新劇場版：破　最新情報". fc2.com. Retrieved April 25, 2015. ^ "Maaya Sakamoto to Play New Character in Eva: 2.0 Film (Updated)". Anime News Network. April 17, 2009. Retrieved November 20, 2010. ^ "アスカは「式波・アスカ・ラングレー」に？「ヱヴァンゲリヲン新劇場版：破」の前売り劇場鑑賞券で衝撃の事実が明らかに". GIGAZINE. Archived from the original on July 10, 2012. Retrieved April 25, 2015. ^ "Eva 2.0, Musashi, First Squad to Premiere in Waterloo (Updated)". Anime News Network. ^ a b "NeoVision Company Limited 新一影業有限公司". Neovision.com.hk. Archived from the original on July 21, 2011. Retrieved November 20, 2010. ^ "REAL ANIME 2010 – THEATRICAL SEASON ANNOUNCED " Madman Entertainment News". Madman.com.au. Archived from the original on December 30, 2012. Retrieved November 20, 2010. ^ "Reel Anime 2010 " Screening Details". Madman.com.au. Retrieved November 20, 2010. ^ "Irish Film Institute". Irishfilm.ie. Archived from the original on July 21, 2011. Retrieved November 20, 2010. ^ • 12:00 pm • Hall Theater help (July 10, 2010). "SCENE Presents Fantasia 2010 | Films & Schedule | Evangelion: 2.0 You Can (Not) Advance". Fantasiafestival.com. Retrieved November 20, 2010. ^ "Evangelion 2.0 visits Germany for Animotion 2009". Affenheim Theatre. May 18, 2009. Retrieved May 19, 2009. ^ "No Evangelion 2.0 & Gurren Lagann on AnimagiC | Affenheimtheater". Blog.affenheimtheater.de. July 23, 2009. Retrieved November 20, 2010. ^ "Sitges Film Festival – Evangelion 2.0: You can (not) advance (Evangelion Shin Gekijoban: Ha)". Sitges Film Festival. Retrieved September 23, 2009. ^ "Asia Pacific Arts: Evangelion 2.0 to be released in the US". usc.edu. Retrieved April 25, 2015. ^ "Evangelion 2.0 Attacks North America". Anime News Network. December 15, 2010. Retrieved December 22, 2010. ^ "Malaysians want Eva 2.0". cinema.com.my. November 17, 2009. Retrieved November 20, 2010. ^ "Anima 2011". Animatv.be. Archived from the original on July 6, 2011. Retrieved November 20, 2010. ^ "Glasgow Film Festival". Archived from the original on January 2, 2010. ^ "VIVAnews – Evangelion 2.0 You Can (Not ) Advance: Para Pilot Muda Kembali Bertarung". Showbiz.vivanews.com. July 19, 2010. Retrieved November 20, 2010. ^ "Movies, Films, Celluloids and More". Pratama Film. Archived from the original on July 15, 2011. Retrieved January 2, 2016. ^ "Bioskop Blitzmegaplex – The Largest Cinema in Indonesia". Blitzmegaplex.com. Archived from the original on September 9, 2010. Retrieved November 20, 2010. ^ 『ヱヴァンゲリヲン新劇場版：破 TV版』 金曜ロードショーで放送決定. "株式会社カラー：最新情報：『ヱヴァンゲリヲン新劇場版：破 TV版』 金曜ロードショーで放送決定". Khara.co.jp. Archived from the original on April 15, 2012. Retrieved January 2, 2016. ^ "『ヱヴァンゲリヲン新劇場版:破』、金曜ロードショーで8月26日放送決定 | ホビー | マイコミジャーナル". Journal.mycom.co.jp. Retrieved October 21, 2011. ^ "Eva:2.0 Returns to Theaters on Same Night It Airs on TV – Interest". Anime News Network. September 21, 2011. Retrieved October 21, 2011. ^ "Evangelion: 2.0 Film's TV Debut Garners 13.1 Rating – News". Anime News Network. September 21, 2011. Retrieved October 21, 2011. ^ "ヱヴァンゲリヲン新劇場版：Q". Evangelion.co.jp. Archived from the original on December 19, 2011. Retrieved January 2, 2016. ^ "Evangelion:2.0 Opens at #1 with 512 Million Yen". Anime News Network. June 29, 2009. Retrieved July 1, 2009. ^ "Evangelion 2.0: You Can (Not) Advance". Box Office Mojo. Retrieved April 28, 2011. ^ "Evangelion 1.0 You Are (Not) Alone". Box Office Mojo. Retrieved April 28, 2011. ^ a b "Evangelion 2.22 Film's Digitally Mastered DVD Listed (Update 2)". Anime News Network. February 3, 2010. Retrieved November 20, 2010. ^ "Amazon JP Gets 88,000 Evangelion 2.22 BD/DVD Pre-Orders". Anime News Network. February 15, 2010. Retrieved November 20, 2010. ^ "Evangelion: 2.22 Film's DVD/BD Pre-Orders Top 800,000 (Updated)". Anime News Network. May 3, 2010. Retrieved November 20, 2010. ^ "Eva: 2.22 Sells 124,000 DVDs, 195,000 BDs on Tuesday". Anime News Network. May 26, 2010. Retrieved November 20, 2010. ^ "Eva:2 is #1 BD in 4th Week, Angel Beats Sells 15K+ on 1st Day (Updated)". Anime News Network. June 23, 2010. Retrieved November 20, 2010. ^ "Summer Wars Submitted for Oscar Nominations". Anime News Network. Retrieved November 20, 2010. ^ "Funimation Adds Eva 2.0, Hetalia Film, Summer Wars". Anime News Network. July 30, 2010. ^ Robert. "Robert's Anime Corner Blog". animecornerstore.blogspot.com. Retrieved April 25, 2015. ^ Evangelion: 2.22 You Can Not Advance. amazon.ca. Retrieved April 16, 2011. ^ "Manga UK Indicates Plans For Eva 2.0, Eden of the East". Anime News Network. May 23, 2010. Retrieved July 31, 2010. ^ "Manga UK to Release Eva:2.22 DVD/BD by End of June". Anime News Network. December 16, 2010. Retrieved December 20, 2010. ^ "Evangelion: 2.22 You Can (Not) Advance (Blu-ray)". Amazon.co.uk. Retrieved June 21, 2011. ^ Evangelion: 2.22 You Can (Not) Advance.. Madman.com.au. Retrieved April 16, 2011. ^ "Evangelion Films' 'Nerv Only' Phone to Be Sold in Japan". Anime News Network. May 18, 2009. Retrieved May 20, 2009. ^ "Evangelion: 1.11 BD & DVD Commercial Streamed in Japan (Update 2)". Anime News Network. May 18, 2009. Retrieved May 20, 2009. ^ "20,000 Evangelion Mobile Phones Sell Out in 5 Hours". Anime News Network. June 5, 2009. Retrieved June 23, 2009. ^ "Eva Phone Supplies Increased by 7,500 to Meet Demand". Anime News Network. June 12, 2009. Retrieved June 23, 2009. ^ "UCC Evangelion Coffee (Japanese)". UCC. May 19, 2009. Archived from the original on May 21, 2009. Retrieved January 2, 2016. ^ "Official Lawson Eva Page(Japanese)". Lawson. May 20, 2009. Retrieved May 20, 2009. ^ "Revoltech Action Figure Lineup (Japanese)". Revoltech Express. May 20, 2009. Retrieved May 20, 2009. ^ "ヱヴァンゲリヲン新劇場版：破 アニメーション原画集 上巻 – 新劇場版：破の原画集が遂に登場！:EVANGELION STORE". Evastore.jp. Retrieved October 21, 2011. ^ Sevakis, Justin (November 24, 2009). "Review:Evangelion: 2.0 You Can (Not) Advance". Anime News Network. Retrieved January 19, 2010. '^ See also Time Out Chicagos review Archived March 21, 2011, at the Wayback Machine: "...more screen time is given to the characters’ personal lives and professional agendas than in the first film. Lead character Shinji’s emotional struggles in particular add some welcome human depth to a confounding and still-unfolding plotline..."
^ "Evangelion 2.22: You Can (Not) Advance BLURAY – Review". Anime News Network. September 21, 2011. Retrieved October 21, 2011. ^ "Neon Genesis Evangelion Movie 2.22 You Can [Not] Advance". Mania.com. Archived from the original on August 22, 2010. Retrieved November 20, 2010. ^ Gilsdorf, Ethan (March 4, 2011). "Evangelion 2.0: You Can (Not) Advance". The Boston Globe. ^ "Evangelion 2.0: Getting animated on a grand scale". thestar.com. January 14, 2011. Retrieved April 25, 2015. ^ See also the Los Angeles Times review: "Trying to comprehend the jargon-rife storylines and high-minded philosophical talk is a demanding task when the pace is so unforgiving, which suggests that this new concentrated "Evangelion" might best be appreciated by those who remember the psychological nuances of the small-screen version. Amid the eye-popping bursts of spirographic CGI imagery there are dramatically interesting kernels, though, like the character of gung-ho pilot Asuka, and dehumanizing issues surrounding high-tech warfare." ^ "When the soundtrack does not pound with computer-game cacophony, there is a weird array of elevator-style music. Clunky lines include: “Encroachment of a core-like substance confirmed near the entry plug area.” By contrast, the mind-blowing look of the attacking angels indicates an intelligent designer far beyond the talent on board here." "Art-house films: ‘Monogamy,’ ‘Nenette’ "
^ '+relative_time(twitters[i].created_at)+' (January 20, 2011). ""Evangelion 2.0" worthy of its predecessor | Northwest Asian Weekly |". Nwasianweekly.com. Retrieved October 21, 2011. ^ "Evangelion: Dark Angels | Fort Worth Weekly – News, Entertainment, Restaurants, Music". Fwweekly.com. Retrieved October 21, 2011. ^ "Evangelion: 2.0 You Can (Not) Advance". rottentomatoes.com. January 21, 2011. Retrieved April 25, 2015. ^ "Eva 2.0 Wins 1st in Animation at Lyon Asian Film Fest". Anime News Network. November 13, 2009. Retrieved November 15, 2009. ^ "Eva 2.0, Summer Wars Win Japan Academy Awards". Anime News Network. December 22, 2009. Retrieved April 9, 2010. ^ "Summer Wars Wins Japan Academy's Animation of the Year". Anime News Network. March 5, 2010. Retrieved April 9, 2010. ^ "株式会社カラー：最新情報：ベルリン『Proto Anime Cut』展に庵野秀明が出品". khara.co.jp. Archived from the original on February 7, 2012. Retrieved April 25, 2015. ^ "Proto Anime Cut – Berlin — les jardins des pilotes". jardinsdespilotes.org. Retrieved April 25, 2015. ^ "Proto Anime Cut – Berlin opening — les jardins des pilotes". jardinsdespilotes.org. January 20, 2011. Retrieved April 25, 2015. ^ "3rd Evangelion Remake Film to Open Fall 2012". Retrieved September 21, 2011. ^ "『ヱヴァンゲリヲン新劇場版：Ｑ』 Blu-ray＆DVD 西暦2013年４月24日（水）発売決定". khara.co.jp. February 19, 2013. Archived from the original on February 21, 2013. Retrieved April 25, 2015. This page was last edited on 29 January 2019, at 10:16 (UTC).